Nadal Wins Record Seventh French Open : The Two-Way The Spanish superstar had been tied with Sweden's Bjorn Borg for the most French wins. He's also now won 11 Grand Slam titles. Serbia's Novak Djokovic was trying for his fourth straight major tournament title, but came up short. 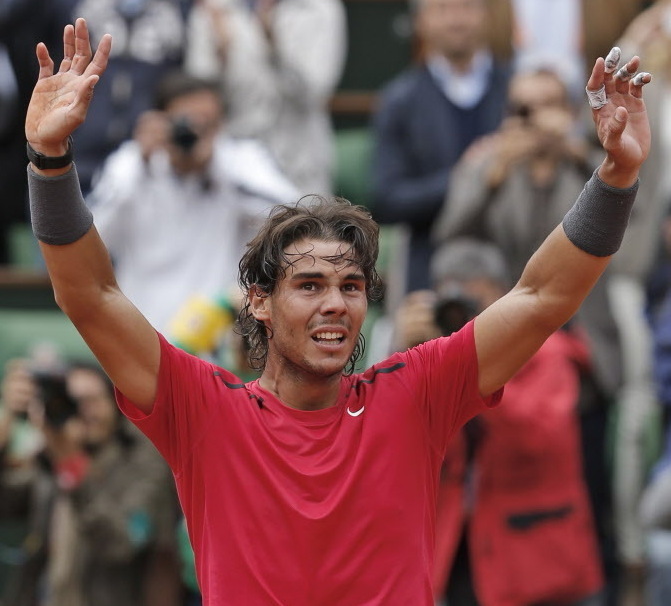 Rafael Nadal of Spain celebrates winning the French Open earlier today. Rafael Nadal today won his record seventh French Open tennis title. His 6-4, 6-3, 2-6, 7-5 win over Novak Djokovic had been delayed a day, when rain forced suspension of play on Sunday. Nadal, from Spain, had shared the record of 6 French titles with Sweden's Bjorn Borg. He's now won 11 Grand Slam titles (the French, U.S., Australian and British opens). Djokovic, a Serbian, had been trying to win his fourth straight major title.